Children who grow up near the ocean usually understand a lot more about the importance that it plays in their lives than children who live further inland. However, in order to gain a real appreciation and understanding of the ocean and ocean life, it is important for children to be exposed to environmental educational opportunities at a young age and throughout their formative years. Ocean education for kids can be a fun and exciting way to encourage your child to be more environmentally responsible and educated about the world around them. Recent studies reveal that a large majority of the American public is only superficially aware of just how important the ocean is to their daily lives and, on a greater scale, to the entire planet. It is important for children learn at a young age that our oceans are a source of food, but they are also a source of medicine, energy and knowledge about our planet. Many kids in the Greater New Bedford area will learn about our region’s history with the sea when they get to school, and will understand that the ocean also provides jobs and is a big part of our local economy. 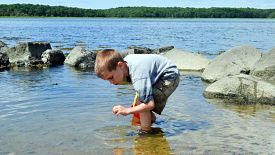 However, it is through educational summer programs for kids that explore natural environments, such as Buzzards Bay and the Slocum River, that children gain insight into the science of the wonders all around them. Most people live their whole lives not understanding all of the benefits that the ocean provides to them on a personal level. Even children who grow up near the water may not understand the impact that the ocean has upon human survival. It is through educational summer programs for kids and educational weekend programs that many children are exposed to this knowledge, increasing awareness and interest in the marine environment. Increasing interest and awareness is a critical step in educating children who will grow up to be the next generation that will be responsible for preserving the natural environment of our oceans. 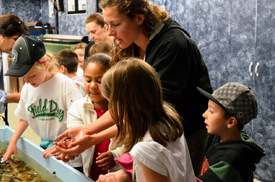 Teaching children how the actions of humans impacts ocean life and the surrounding environment is an important first step that will connect your child to the seaside communities of Southeastern Massachusetts and the inland environmental areas as well. Ocean education for kids in the summer months, on weekends and even through holiday-specific programs, has the potential to inspire children to want to learn more and improve their understanding of the ocean and the impact it has on their lives. Educational studies reveal that the scientific literacy of high school graduates in our nation is very much below the international average. Embracing a child’s natural curiosity about their local environment at a young age is a great way to encourage a lifelong interest in the connection between marine life and the seaside communities of Southeastern Massachusetts. We need to prepare future generations to appreciate the marine environment and educate them about its importance if we are to create future ocean stewards, adults who will make important decisions about issues related to both ocean and coastal environments. Fun activities for kids that focus on ocean education can be just the inspiration your child needs to foster an interest in the local environment that will last a lifetime. Lloyd Center in Dartmouth, Massachusetts provides children of all ages with various hands-on activities and experiences through vacation week programs, seasonal camps and other educational weekend programs. Parents looking for fun and educational summer programs for kids in the Greater New Bedford area will appreciate the variety of programs available to both local and visiting children. This type of experience-based learning through the guidance of knowledgeable naturalists helps kids to foster a love and appreciation for ocean life and the natural environment of the Southcoast region. Fun activities for kids are offered throughout the year. Each month offers new, experimental programs and outdoor adventures designed to encourage children to want to explore topics in natural history and science. A hands-on summer science program will do more to spark your child’s interest about nature and the environment than any book, film or in-school experiment ever could. The “Under the Sea” program is available every Monday from July 1st through August 12th throughout the 2013 summer season. Children will get to learn about all of the amazing creatures that live in our oceans and will get to explore and discover the ways that animals live and survive underwater. This experience includes trips to live animal encounters, the estuary and a touch tank to get the children up-close and personal with nature. The Young Naturalist Program at the Lloyd Center is designed for children between the ages of five and seven. While education is the goal, the tools used to encourage interest include activities, crafts, hands-on games and trail walks that they will enjoy and look forward to all summer long.